You said yes to the proposal. You announced your engagement on Facebook. You’ve picked a venue. You said yes to bridal lehenga. Did you choose a name? Indian society is filled to the brim with people who give you expert tips on how your marriage should be like – whether you like or not. One such instance is that of changing your maiden name and adopting your husband’s surname instead. While in contemporary times, modern girls have their say in all walks of life, including making a choice to keep or discard their hubby’s name, it’s hard to avoid the public debate when taking this bold decision, which is often laden with guilt and stereotyping. 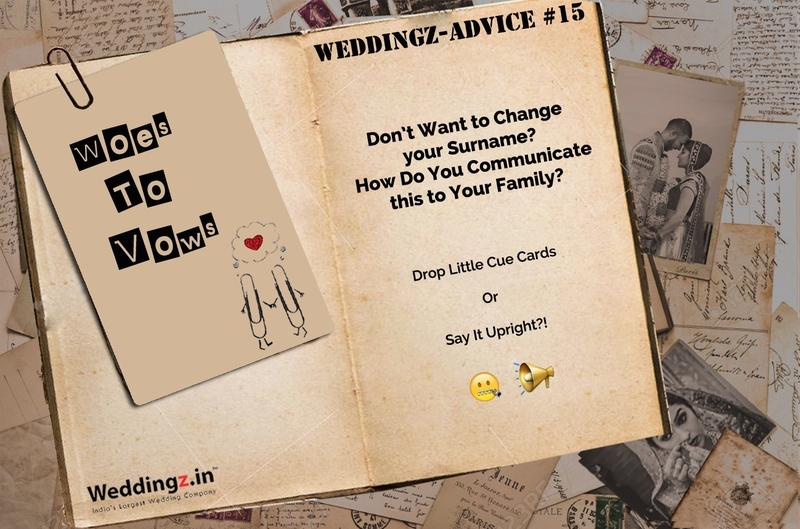 If you’re the kind who hails from a deeply rooted traditional family, finding it a tad bit difficult to communicate to your parents why you don’t wish to change your surname, we give you some light-hearted ways to break to the news without getting any ‘haaaaws’ in return. Here goes! As cheesy as it may sound, let them know that you love your name, especially if your partner’s name is as weird as Phunsukh Wangdu, remember that scene from 3 Idiots where Kareena refused to changed her surname?! I LOVE THE LINEAGE CONNECTION! Sometimes, emotions work and for some going overboard with emotions work all the more amazingly well. Cry and howl if required to convey to your loved ones how much the surname and its lineage means to you. Explain the emotional connect that you have with your maiden name (obviously not revealing the true motive of all the hassles you may have to face with changing your name completely creating a new identity of yourself). This brings us to the next point, where the frustration of dealing with creating a whole new identity is not acceptable by modern brides, who’ve toiled their way up to establish their individual identity. Why let go just because you’re married now. Explain to your parents and in-laws that this is who you’re and how the corporate world well knows you as. Changing you name will only lead to more struggles. If they’re supportive of your career and proud of your achievements, you need not worry as they will eventually come around it. There’s no shame to be a lazy bride. If dealing with legal paperwork and all that jazz has never been your cup of tea, its best to communicate this as early as possible to avoid more complications and last minute hush. HUBBY DOESN’T WANT ME TOO! If all things fail, blame it on the hubby. Your parent’s and in-laws will surely not mind if he is okay with you not changing your surname. With modern to-be-grooms not hesitating in taking up their wifey’s surname, it becomes all the easier for you to convince others. These were just some fun ways of how you can approach your parents and in-laws about this bold decision. With changing times most elders do understand the modern complications that involve with name changing, so relax and just communicate. And let us end with a wise quote by John Powell here that "Communication works for those who work at it".